I’m here because two years ago, I released for a French Think Tank, the Turgot Institute, a full study reviewing the housing public policies in France. As the study was deeply appreciated, it became a book. One of the purposes of the study was to understand why we experienced such an unprecedented housing bubble. When the study was ordered, we thought that our study would mainly emphasize monetary phenomenon, or issues relative to credit practices, just like the one which exist in the USA. We expected that land use regulations would be one factor among others. It appeared to be, by far, the main factor explaining our bubble. Did we have a real estate Bubble in France, like in some parts of the USA ? The answer is obviously: Yes. The median multiple (using net disposable income) of real estate deals on the territory began to diverge from its historical mean of 2.9 (which was observed, within a 10% fluctuation range, between 1965 and 2000), at the beginning of the new millennium, and reached a whopping range of 4.6 to 5.0 in 2007, according to various sources (The following graph uses ratios relative to gross disposable income so figures are a bit lower, from 2.5 to 4.2) . This bubble was especially remarkable because it was the first time it reached such intensity, but also because for the first time, it was not an “urban bubble” or a “Paris Bubble”. Prices of existing or new homes peaked in the same proportions either in central metro areas or in rural cities as far as 30 miles from these metro areas. They peaked in many metro areas with 50 000 inhabitants and more, not only in very big dense areas like Paris or Lyon or Azure Coast. This graph shows that house prices increased 90% faster than households’ revenues between 1997 and 2007. In non inflation-adjusted prices, it corresponds to a whopping 140% gross increase. Most publications explain this only by an increase in demand favoured by low credit rates. Of course, this explanation is half true, since average fixed rates to households were divided by a two fold between 1997 and 2005 (from 8.6 to 4.3%). This fall of credit rates allowed borrowers to lengthen the maturity of their loans, and, at equal revenue, a typical household could borrow about 50 to 70% more than it could before. Many analysts stop their reasoning here. “That’s demand, period”. Every good economist should react to this by saying that if the supply was not constrained, an increase in household’s solvability would result in an increase of housing supply, since early signals of price hike would bring newcomers on the market. Especially, housing market has very low barriers to entry, isn’t prone to the formation of monopolies… This didn’t happen. We can see that, despite price increase begun in 1999, the supply began to soar only in 2004, and remained far under historical records (553 000 homes in 1973). How can we be sure that most part of the housing bubble comes from land use regulations? First, if the gross price of homes and flats grew by 140% in the ten years of the bubble, construction costs only grew by 30% in the same time. It’s about 10% more than inflation. It can’t explain a 100% price hike on every home, new or ancient. Construction costs grew at a much slower rate than CPI between 1965 and 1997, the current trend inversion comes mainly from some regulatory strengthening in public housing, and some workforce shortages in some particular housing jobs. Not something really relevant compared to the global price increase. But when I studied the share of land into the price of new homes, I discovered that raw developable land prices increased 6 times in the same period, though the costs of technical land development (sewage, electricity and other networks, roads and so on) only grew in the same proportions than construction costs. In fact, in most areas, land prices were the same in Euros in 2007, than they were in our good old Francs in 1997 (1€ # 6.5 Francs). On coastal areas, the prices increased from 10 to 12 times. Only in some very isolated and economically very depressed rural areas, we didn’t see such prices increases. Agricultural land didn’t follow the same trend. Even at more than 15 miles from big metro areas’ fringes, developable land is as much as 200 times more expensive than agricultural one. At the fringe of big cities, the factor can jump up to 500 or 1000 times. The latest point that convinced me that we were experiencing a “land oriented bubble”, was the discovery that in most housing programs with multiple lots, small lots were sold at much higher rates, in Euros per square meters, than bigger one. This shows the presence of a “regulatory penalty”, as first described by US economists Glaeser and Gyourko. This penalty corresponds to the price of a theoretical zero square foot lot on an operation. We don’t have, in France, national databases with free access that could have allowed me to compute precisely this regulatory penalty. But some examples coming from real operations show that this penalty, in rural towns neighbouring (20-30 km) big cities, could represent about one third of the total cost of the home in 2006, much more than in 1998 or 2000. And, sometimes, it may be more. Do we have a tough land use regulation in France? The answer is, once again, yes. The current frame of our regulation comes from a 1967 law, which allowed cities to promulgate zoning plans. That doesn’t say that there was nothing before: there were rules that “protected”, i.e. prevented from being built, agricultural land. But the 67 law marked the beginning of the application of zoning laws in France. You will say: how a regulation promoted in 1967 could produce some real estate price frenzy only since 1997 ? This argument is often raised by people who don’t want to hear about the responsibility of zoning laws in real estate bubbles. The answers are multiple. First, general economic theory reminds us that you must have high demand and a constrained supply to get prices becoming mad. The two conditions were not met together until the late nineties. Inflation, and thus interest rates, was high in the late 60s, in the 70s and during the 80s, when central banks decided that inflation had to come back under control. High interest rates didn’t allow too long lending times, so the maximum prices people could afford for homes wasn’t so high. In the beginning of the nineties, most western economies (USA, UK, France, Germany, Sweden…) were slightly depressed, and the real interest rates (the difference between gross rates and CPI rates) remained high. You need both factors to get a bubble started: high demand fuelled by low credit rates, and tough development regulations. Interest rates determine how much you CAN pay for your home, but regulations strength determines how much you WILL pay, somewhere within the range between zero and what you can pay. Second point, the focus of the land use regulations shifted from early times to now. In the first times of their applications, so called “sprawl” wasn’t a great issue out of the circles of professional planners. So the regulatory tools to prevent sprawl were there but the elected councils weren’t eager to use them too much. Zoning plans were used to try to separate housing activities from other ones. So the first plans that were made in the 70s didn’t really limit or restrict access to developable land. And most of the smaller cities didn’t make zoning plans, because it wasn’t mandatory. 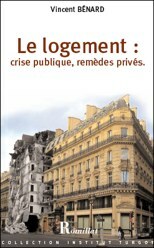 Let’s add that the 60s and 70s were, in France, the golden age of public housing constructions, generally with regulatory “exemptions” from the 1967 common law... As the dominant ideology was that state had to do something to provide dwellings to low wage families, it made it on a wide scale (state was not heavily in debt in those times). Let’s come back to our regulatory zoning purposes. In the late 80s, we began to see a shift into the purpose of regulatory zoning. Environmentalist movements became to sue cities councils whose zoning plans didn’t address environmental issues enough, from their perspective. They were greatly helped by additions of successive layers of European and National laws over the 1967 framework. The new layers reinforced the obligation to preserve natural and agricultural land from being built. Coastal laws, Wet zone laws, biodiversity laws, natural zones preservation laws… In the same time, environmentalists were successful to push “sprawl” as the ultimate evil in many politicians’ minds. So zoning plans became progressively anti-sprawl plans, too. All this stuff came mostly during the 90s and turned the regulatory process of building a new zoning plan into a real mess. In the USA, Glaeser and Gyourko showed that the crucial variable that explained most of the bubble in the USA was the necessary time to build homes from scratch, on a raw land. When you put a long bureaucratic regulatory step for the sole purpose of making a raw land authorized for building, you’re likely to push up prices when demand soars. In France, the necessary time to shift from an old zoning plan to a new one, when the old one didn’t fit any more the current needs of the city, was estimated to about 18-24 months in the 80s. Now, three years is the minimal time frame to put these new plans to birth. But if some environmentalist associations put the city’s project into litigation, the process can last much longer. I saw some small cities struggling in 7 years of judicial battles, just to add +- 50 acres of new developable land into their plan. For example, it took 6 years to the 20 cities of the metro area of Nantes (# 800 000 inhabitants, ranking #10 in France) between the beginning and the end of the elaboration of their latest plan, brought to life in late 2007. Of course, for some limited purposes, the law provides some “quick change” possibilities. But even with those tools, you have to spend at least 6 months to put very small amounts of land into the building market. And even for those limited development openings, you can face judicial procedures, so a one year time frame for small changes is closer to reality. So the process of building a new zoning plan is such a hassle that new cities’ councils don’t want to engage too often into it. Once per election cycle is the great maximum, and a plan must last at least 10 to 15 years. So you have to forecast in advance the amount of land you will have to use to meet the housing needs of your population. The plans that came into applications in the early 2000s were built during the mid 90s: at this time, the rhythm of new construction was driven by high interest rates, and nobody could forecast a big drop in interest rates. So many councils didn’t put enough land with immediate availability in their plans, and if some of them put some land for “future” availability, with “quick change” processes available, it was generally not enough to follow the huge increase in demand driven by credit rates. So the price of land started to soar from 1998 to 2007. I used the same “rough edged” calculation formula than Randall O’ Toole used to determine the planning penalty paid by US house purchasers to sellers in his “planning penalty” report released for the ADC and the Cato Institute a few years ago. For the year 2005, the house price index, relative to the households’ revenues, reached a value of 170. If you assume conservatively that values within the range of 90-110 are historically normal, that 10 additional points could be attributed to a slight increase in building costs, and that historical prices doesn’t include any share of planning penalty, it leaves us with 50 points on 170, about 30% of the total, that can be attributed to the planning regulations. There were about 800 000 housing deals concluded during this year, at a median price of 192 000 Euros (# 215 000$ Purchasing Power Parity Adjusted at this time). If our land use regulations have been closer to the one existing in Dallas or Houston, every French household purchasing a home could have saved 57 000 Euros or 64 000$. The total sum transferred from purchasers to sellers in 2005 was about 46 Bn Euros, i.e. 2,7% of our GDP. Who are the “winners” and the “losers” of the planning penalty? People generally feel richer when their homes see their market value increasing. But are they really? People who sell an overpriced home win nothing if they have to buy an overpriced home in the same time. Except that transaction fees and taxes are generally calculated from this overpriced tax base… The first purchasers are clearly the losers in this situation. On the opposite, people who own several houses and who can sell them just to reduce their real estate inventory are neat winners. So are landowners whose land has been promoted from “non developable” to “developable” and thus sold it at a good price to developers. Though no statistic corroborates this view, it’s not exaggerated to say that the group of home purchasers is, in average, less wealthy than the group of home sellers. 46 Bn Euros are 9 times more than the money that France devotes to the minimal social revenue for the poorer families, or twice the amount of subsidies devoted to public and private housing. The law of unintended consequences strikes again through the observation of the effect of anti-sprawl laws on population growth. Here’s a map of the country surrounding the city of Nantes, but I could have Chosen Montpellier, Rennes, Lyon or many others to illustrate my point. On this map of the Nante's region, The two biggest yellow zones are Nantes and Saint-Nazaire metro Areas. Nantes and its region experienced a neat positive migration flux from people coming from more expensive places, mostly from Paris. As you can see, Nantes and Saint nazaire grew, but slowlier than the department's average. But now, see the number of red and brown circles surrounding Nantes. Most of these cities are small, from 1000 to 15 000 inhabitants. They grew up to 45% in just 7 years during the bubble. Though these small cities experienced the same land price hike (# 6 times in 10 years) than bigger ones closer to Nantes, they remained the only place where middle wage families could afford a lot to build a home. But such small cities were not prepared to see their population growing so fast. Despite a widening of their tax base, they can’t face the induced expenses in new schools, new school bus lines, new swimming pools and sport facilities… Remember that in France, many of these amenities are nearly exclusively provided by the public sector. So some housing programs in these small cities have just become rural dormitory-cities. Roads leading to big urban Areas like Nantes or Saint-Nazaire (#150 000 inhabitants) are overly congested and have sometimes badly deteriorated, since neither structures nor crossings were originally made for the traffic levels we’re experiencing today. Anti-sprawl laws, by making more difficult to find affordable homes in the boundaries of big metro areas or at their immediate fringes, created anarchic development in rural areas which were not able to bear such unprecedented growth. For the first time, the 2006 activity report of our central agency for corruption prevention noticed that urban zoning laws and land use regulations were becoming a major source of concern, as the difference between farmland and land for housing grew. Of course, the phenomenon can’t be quantified, but officials refer to it as “not any more anecdotal”. Zoning law didn’t prevent our urban landscapes from being messed up by big “soviet like” buildings, generally erected in the frame of big public housing programs from the 50s to the 70s, which obtained special derogatory rights because of their “social purpose”. More interestingly, it looks like beautiful landscapes’ preservation tends to be endangered when the land is under the threat of being too severely protected by the zoning laws. One example : great wildfires generally occur from beautiful woods that could be classified as “natural reserve”, or anything approaching. Most of them are considered as arsons. Why is there a political demand for such zoning laws? Who makes a living from zoning laws? People tend to love freedom for themselves but fear freedom for others, because “others” could make a bad use of this freedom. Zoning laws are the political answer to this demand. People well connected use the “democratic process” to maximize freedom to use their own land according their own goals, when the land use plan is elaborated. Then they try to limit this ability for others, either because of inherent NIMBYism of human nature, or in order to maximize the gain they can get from these regulations. This demand is addressed first by local elected, who generally see in zoning laws a good way to protect their own interests, and, eventually, to harm their local opponents. Second, a huge bureaucracy emerged either in big cities, or ingovernment agencies, under the pretext of “expertise”, which must absolutely legally be associated to the democratic process of elaborating plans, or is in charge to enforce them. Since the 80s, when European laws made more difficult for French state to do things that can be normally made by private contractors, the bureaucracy which “made” plans just turned into a bureaucracy which “supervises” the private consulting firms which are paid to elaborate plans. So there is a huge and influential private sector taking advantage of state made zoning laws, which is efficiently lobbying to extend them. Crony capitalism is always the best ally of socialism. How many people are involved in this heavily state generated business? It’s impossible to figure it out exactly. My very own rough calculations comes to a very conservative estimate of at least 30 000 people (full time adjusted) under public job contracts, living from zoning. And it doesn’t include private contractors, full time or occasionally working for zoning purposes. Things becoming worse: towards new urban disasters ? This lobby is far more efficient than the very few economists who dare to examine the role of land us regulations in the economy. Even if some politicians start admitting, very smoothly, that there is a regulatory problem with our land use regulations, they remain inaudible. There is absolutely no doubt, in the view of the two main political parties in France, that sprawl is evil, and must be fought. And the recent carbon dioxide Frenzy has led to the creation of new regulatory powers which carefully tend to impose their own anti sprawl views to cities, even if cities would like to deregulate, or even simply relax regulations aimed at limiting sprawl. Until the end of the 90s, even if big cities were bound under tough regulations to elaborate their plans, at least they were under competition to create the most entertaining places to attract people. This could lead some peripheral suburbs to adopt less severe restricted policies, which at least provided some oxygen to home builders. This ability is disappearing through an insidious process, namely “intercommunality”. For instance, the 22 cities of the metro area of my living town of Nantes have been “strongly convinced” to elaborate “joined plans”, under an exhaustive “coherent sustainable development scheme”. What’s the result? There are still about 17 300 hectares (#40 000 acres) of farm land at the fringe of Nantes Metro Area. The sustainable development plan imposes that this amount shall never go under 17 000. So, at least for the next 15 years, there are only 300 ha (#750 acres) of new farmland available for new buildings. So few for a nearly 1 million people metro area! Metropolitan areas like Rennes even decided to impose a green urban boundary around them. Prices in Rennes have been Skyrocketing during the bubble years. Many metro areas across the country are currently adopting such mandatory “sustainable development schemes” (In French, "SCOT", Schéma de Cohérence Territoriale"). New buildings will only be made on brownfields, or on existing homes, in the frame of publicly driven operations of “urban renewal”. The current motto of planners is: “we have to rebuild the city over the city”. It sounds beautiful, but will surely turn many of our cities into new urban disasters. The Austrian Economist Friedrich Hayek famously stated that no planners, no experts, can handle all the criteria that every individual decision requires. Even worse for planners, they can’t evaluate how subjective valuations of every individual criterion can change with time. So they tend to give importance only to the criteria that are important to them, and to the politicians they’re advising. In the 50s and 60s, they focused mostly on the quantitative need for new dwellings, so they created dehumanised soviet-like suburbs which today are concentrating all the problems of poverty and frustration of our society. They created more than 700 so called “urban ghettos”, urban disasters with awfully degraded dwellings, lack of basic equipments like libraries, high schools, and so on… The spiritual children of these early planners now say us that they will reinvent the town. They promise us new “ecopolis” just as our elders were told about “radiant cities”. It's time to be afraid ! Planners tell us that leaving free market forces at work on land use matters would lead to anarchy and environmental disasters. But, seriously: When private developers fail so miserably, they tend to do it once. Perhaps twice or three times, because sometimes several competing bad projects are brought to markets simultaneously. But never has any business driven under undistorted market laws generated more than 700 failures ! And nobody says we should let build anything without some environmental requirements. But environmental concern must not become a pretext to prevent anything from being built. As Hayek said, market acts as a “decentralized planner”: private developers are careful to bring to the market developments that market wants. So they have to take in account what’s existing. So called “market anarchy” is only the expression of the impossibility to valuate how individual preferences will change over time. Price system is the way people make compromises between what they would like to have in an ideal world, and what they can afford according to their revenues. Markets are the best tools to make these millions of individual adjustments possible. Another consequence of the current planning frenzy, and this will be my conclusion, is that as soon as economy will recover – and if none knows when it happens, it will happen – and therefore demand for houses will soar again, then, we will know another housing bubble, and another housing bubble crisis, with all its disastrous social issues. Knowing all we now know about the deadly economic, political, environmental and social effects of zoning regulations, we should take the opportunity of currently falling prices to scrap down all these regulations, because house owners won’t be as much concerned by the loss of value of their homes, since it’s happening all the same. We should enact land regulations that let owners decide what to do with their land. But I'm not that optimistic: planning forces are too powerful, it won't happen. French Savvy readers can read more articles on french housing policies and economics of housing market here. c'est étonnant ce sujet, car hier soir chez Tadei et aujourdhui dans 'c'est dans l'air' il parlait du grand paris et des nouveaux projets pour Paris! aucun des invités n'avait lu cette oeuvre majeure ? Scandââle ! Et en plus, vous voudriez que tous ces grands expêêêrts tiennent compte de ce que veulent les français de la France d'en bas ? Mais avez vous perdu tout sens commun ? Alors que nous en sommes tout juste au léninisme ! J'ai regardé pendant une époque cette émission que je trouvais impertinente... mais en fait, ce n'est rien d'autre qu'un rassemblement de gauchistes bien-pensants qui se paluchent copieusement de leurs idées "progressistes" et se donnent des grands tapes dans le dos. "Gauchistes", ce n'est même pas en rapport avec leur opinions politiques car tout le monde est "gauchiste" en France ! quand cessera-t-on d'être aussi émotif sur tout pour enfin penser vraiment ? Vivement que je me casse de ce pays de c*** (pour la plupart). oui mais de temps en temps il y a un trublion dans le tas, et c'est ça que je cherche... Sorman, Laine, et d'autre dont je me souvient plus du nom. Seul chez Tadei on a la chance de temps en temps de laissez parle un vrai libéral, un défenseur du temps de Reagan, et même de Pinochet... C'est vrai que pour la plupart ce sont des gauchistes mais parfois il y a une surprise!! !